I'm not sure what took me so long to add this blog to my list of links. Andrew Baksh is a well known birder around New York City and Long Island. If a rare bird has been found, Andrew is usually one of the first on the scene. His blog "Birding Dude" is loaded with great photos and lots of birding information. On Monday Robin and I rode our bikes to Floyd Bennett Field and Jacob Riis Park. 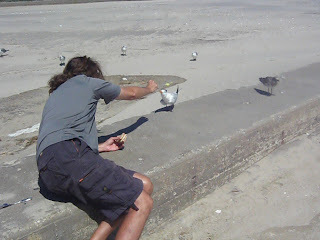 The highlight of our day was an encounter with a Royal Tern who had an odd fetish. Along the beach at Jacob Riis Park the storm has exposed a lot of the park's old concrete walkways, most of which has been buried for decades. It created a convenient place for us to park our bikes, eat some lunch and lie in the sun. A storm weary Royal Tern decided to hop up on the wall and join us. His wings drooped from exhaustion and he looked a little disheveled. I felt sorry for him and shared a bit of my sandwich, which he readily took from my hand. Once the sandwich was finished he set his sights on something a little, well, fetishy. Robin had worn her bathing suit under her cycling gear. Lying in the sun, she had placed her cycling clothes, which included a sports bra, in a neat pile on the wall. I was eating a plum when I noticed that the tern was slowly waddling over towards her clothes. I watched in disbelief as he grabbed the corner of her bra (must have been a "he") and prepared to make off with it. Robin yelled, "HEY", and grabbed the opposite end of the bra. There was a brief tug-o-war. One might think that Robin's ire would have chased him off, but it didn't. He hung around a few feet from us for about 20 minutes. Eventually he took off and joined some other royals down the beach. It's fairly unusual to see Royal Terns in NYC, but to see the rare subspecies Sterna maxima fetishii is really special. Unless of course it makes off with your underwear. 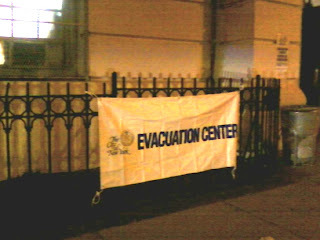 Brooklyn survived Hurricane Irene with much less damage than anticipated. Some neighborhoods lost more trees than others and, according to my friend Peter (who works in landscape management) Prospect Park had about 100 downed trees. The good news for birdwatchers was that the huge storm system carried an amazing array of rare birds into New York City and surrounding area. I never actually even heard the storm as I slept and awoke thinking that it had somehow managed to detour around Brooklyn. Heydi texted me early that Doug, Shane and her were at Floyd Bennett Field looking at some incredible birds. Large numbers of seabirds had taken refuge along the pavement at the old airfield, as well as, a flock of 10 Hudsonian Godwits (I've never seen more than one Hudsonian Godwit at a time). The list of terns at Floyd Bennett included Gull-billed Tern, Black Tern, Royal Tern and Sandwich Tern! The Sandwich Tern is a bird of the southeastern United States and the Caribbean. I've only seen this species in Florida. All public transportation in New York City had been suspended, so my only option for traveling to coastal Brooklyn was by bicycle or walking. I guess I'm getting a little wiser with age, because I decided not to make the 10 mile bike trip through potentially downed trees and deteriorating conditions once the back end of the storm swung around. By around 9:30am on Sunday it was apparent that the worst of the storm was over, so Robin and I put on our rubber boots and walked up to Prospect Park. The waterways all eventually flow into Prospect Lake, so I expected that the entire lake would be overflowing it's banks. Several large trees had come down in the Peninsula Woods. A large willow was resting on the rustic shelter at the end of the point. A Bald Cypress near the Peninsula "Thumb" snapped off at the base and blocked the two footpaths to the lake's edge. We climbed through the maze of branches to get a better look at some terns and swallows flying around the lake. I was glad we did as one bird turned out to be a Black Tern. These small seabirds are rarely seen around Brooklyn outside of the coastal beaches, and even then they are uncommon. Among the Barn Swallows zipping low over the water was a single Purple Martin. We ran into Peter who was also scanning the birds over the lake. I told him about Heydi's early morning text message and he volunteered to drive his car to Floyd Bennett Field. Mary and Donna would be joining us. When we arrived at Floyd Bennett Field we were notified by a ranger at the main entrance that the park was closed to the public. 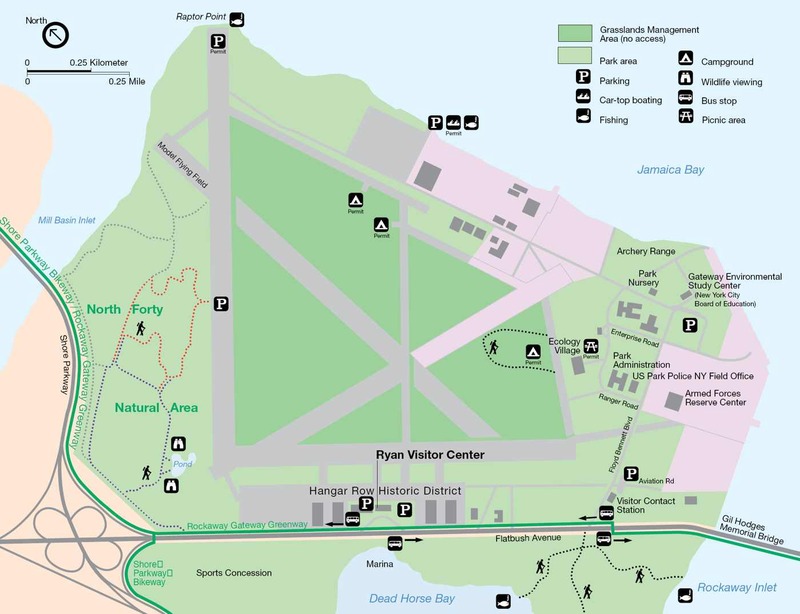 Undaunted, Peter parked the car on Flatbush Avenue, near the marina, and we walked in at an open gate near the Ryan Visitor's Center. A few dozen gulls and terns were roosting on the empty parking lot in front of Aviator Sports. Among them were several Royal Terns and a single Caspian Tern. A small flock of shorebirds foraged in a puddle at the north edge of the pavement. Within the mix of Semipalmated Sandpipers, Least Sandpipers and Lesser Yellowlegs was a lone Baird's Sandpiper. Over the next 2 hours we walked the runways, cut through the campgrounds and scanned the shore at the end of Archery Road for any other unusual birds pushed in by the storm. By 3:30pm the skies darkened, rain started to come down and a strong northwest wind kicked up. Mary had already returned to the car, but Donna, Peter and I had to walk back 1.5 miles into the driving rain. By the time we got into the car I had a better idea what it felt like to be one of those terns roosting in the parking lot. During a 48 hours period incredible reports from birders around New York City and the surrounding area were coming into the regional discussion groups. Uncommon and rare seabirds were being seen from Long Island, throughout the city's 5 boroughs and the Hudson Valley. Perhaps the most bizarre sighting was of a White-tailed Tropic Bird along Manhattan's Hudson River. This bird (and two more reported) were far from the tropics. Just for laughs (and to enjoy some of these birds vicariously as I only managed a small portion of the total), I scanned the postings and created a "Storm Bird" list for NY. I omitted songbirds from the list as I didn't read about anything unusual. For the shorebirds I only included the uncommon and rare species that were reported around the area. I did, however, included ALL the tern species that were reported, primarily, because the combined list looks so ridiculous. It is nearly a complete list of all the eastern terns of North America. What And Where Are Tar Sands? 1. Tar sands, or oil sands, are a mix of clay, sand, water and oil -- specifically bitumen, which is a heavy, viscous material. 2. Tar sands can be found in many places worldwide, but the largest deposits are in Canada and Venezuela. There are some tar sands in the US as well, located mainly in eastern Utah. 3. The tar sands of Alberta, Canada, are located under Canada's Boreal forest, one of the largest intact ecosystems left on the planet. 4. Northern Alberta's oil sands deposits cover 54,000 square miles -- so large that the region is second only to Saudi Arabia as a potential petroleum source. 5. Unlike drilling for oil deposits and pumping oil from the ground, tar sands have to be mined to get at the bitumen and refine it into oil. 6. Bitumen is comprised primarily of polycyclic aromatic hydrocarbons which can be highly carcinogenic (the EPA has classified seven PAH compounds as probable human carcinogens) and requires extensive processing to make it thin enough to flow through pipes. 7. Four tons of sand and soil are removed and dumped for every one barrel of oil gained from tar sands. 8. The majority of Canada's tar sands oil is exported to the United States. Approximately 20% of US crude oil comes from Canada, and 40% of Canada's oil production is from tar sands. 9. As prices for crude oil rise, tar sands-based oil production in the US has become more commercially attractive to both the government and industry. 11. According to a recent Environmental Defense report, tailing ponds leak approximately 3 million gallons of contaminated water each day. 12. Environmental engineer John Stansbury notes that while TransCanada estimates the possibility of 11 serious spills on the pipeline during the course of 50 years, existing data suggests a more realistic estimate would be 91 accidents during a 50 year period. 13. Tar Sands operation is allowed to draw 12,325 cubic feet of water annually. This is twice the amount of water consumed by the entire city of Calgary. Approximately 82% of the water comes from an already dwindling Athabasca River. 14. Just one of the four operating mines in Alberta has excavated more soil than the Great Pyramid of Cheops, the Great Wall of China, the Suez Canal and the world's 10 biggest dams combined. 15. Tar sands oil production emits 3 times more carbon dioxide per barrel than conventional oil consumed in the United States. Removing the carbon-storing forest ecosystem to get at the tar sands will be even more detrimental to carbon emissions levels. 16. The Alberta Tar Sands are the fastest growing source of greenhouse gas emissions in Canada. 17. By 2020 the Tar Sands will release twice as many greenhouse gases than currently produced by all the cars and trucks in Canada, if current development plans move forward as scheduled. 18. Emissions from expanding tar sands production and use will overwhelm emission cuts in energy production elsewhere, undermining Canada's efforts to cut greenhouse gas emissions 17% by 2020, as pledged under the Copenhagen Accord. 19. Tar Sands extraction utilizes enough natural gas to heat over 3 million homes in Canada. Using natural gas could both hasten the return to coal for domestic heating and electricity, as well as help push Canada toward building more nuclear power plants. 20. Over the next 30 to 50 years, as many as 166 million birds could be lost, due to loss of breeding areas and from birds landing in toxic tailing ponds. 21. Caribou populations have been dwindling in Alberta for several decades, and may be gone entirely within 70 years -- or as little as 30 years in the Athabasca Oil Sands area. Research suggests that human activity related to oil production and the timber industry are primary culprits in caribou declines. 22. Oil contamination in the local watershed has led to arsenic in moose meat at as much as 33 times acceptable levels for consumption. Game animals have been discovered with tumors and mutations. 23. As the climate warms, northern forests will be more and more important to plants and animals shifting to the cooler north to survive. But tar sands activity will pollute and remove substantial amounts of that important habitat. 24. Aboriginal populations downstream from tar sands operations are experiencing increased respiratory diseases, rare cancers and cardiovascular problems. The cause is suspected to be the toxic substances leached from Tar Sands production. 25. Substance abuse, suicide, gambling and family violence have increased in the tar sands, and thousands of workers brought in by oil companies face a housing crisis in northern Alberta. 26. More than $200 billion has been invested in the Tar Sands as of 2009. Only $1 billion (over 5 years) has been invested in alternative energy projects as of 2009. 27. In July 2008 alone, oil sands companies held a total of 36 meetings with Canadian ministers and government officials, while only seven environmental groups and associations reported lobbying activity. 28. The National Wildlife Federation points out that the project developer TransCanada has inflated the idea of job creation from tar sands production. A closer look at their analysis reveals gross exaggeration, including estimating that the 3,500 to 4,200 construction jobs would, in turn, create 22,582 retail trade jobs. 29. Indigenous groups have organized and protested to stop the expansion of tar sands operations. 30. In another Ipsos Reid poll from 2009 found that overall, 64% of Canadians say development of Alberta's tar sands should be halted until a clean method can be found, as do 47 per cent of Albertans. 31. In the most recent tar sands protest at the White House in Washington DC during late August, 162 protesters were arrested over three days. Meanwhile, over 2,000 people signed up to continue the protest. Fifty protesters will take to the White House each day, every day until September 3rd. 32. If the U.S. government approves the pipeline, preeminent climatologist James Hansen says that it will be "game over" for the global climate. Sunday, September 4, 8 a.m. I decided to do a little pre-hurricane birding around Brooklyn to see if anything unusual has showed up. I had planned on cycling down to Floyd Bennett Field to meet up with Heydi and Shane, but had a change of plans. I received a text from Heydi in the morning saying that Floyd Bennett Field was closed?! She arrived early and the gate at Aviator Sports was closed and locked. Fortunately, the gate in front of the Ryan Administrators Center was opened. After only a few minutes an NPS employee notified her that Floyd Bennett was closed. Shane arrived and the two of them decided to head to Prospect Park. Glad I didn't make the long ride down there just to turn around and go back. I texted back that I'd meet them in the park. My neighborhood is one of the few that is far enough away from the coast that it isn't in any of the flood zones. In fact, one of the evacuation shelters is just down the block from me. The entire mass transit system was shutdown at noon today, so the only practical place to look around for birds was up the block in Prospect Park. The was a light drizzle falling when I hopped on my bike to meet Heydi and Shane. When many birders were strategizing on how to search for possible rare birds along the coast during the hurricane, I was being a little more pragmatic. I love birds, birding and finding rarities, but would rather not become a candidate for the next Darwin Award. I'd rather wait until Monday, especially since most of coastal NYC in under mandatory evacuation. Keir had texted early in the morning that he spotted a Yellow-breasted Chat on Lookout Hill. I haven't seen one of these elusive warblers is a few years, so that's where I headed. I met Heydi and Shane on the stairway next to the Maryland Monument. There were a few warblers foraging on the hillside - a couple of Ovenbirds and black-and-whites - but nothing unusual. After about 15 minutes several warblers began to appear in the treetops on the east side on the stairs. A Blue-winged Warbler was the first bird I noticed. Shane spotted a Chestnut-sided Warbler in its olive-green fall plumage. Then a mixed flock of feeding songbirds arrived and, in quick succession, we added Red-eyed Vireo, Blue-gray Gnatcatcher, American Redstart, Magnolia Warbler and Black-throated Blue Warbler. It felt a little weird to be counting songbirds. I realize that it's almost Autumn, but I'm still in Summer shorebird mode. I usually don't begin scouring the woodlands until September. Anyway, we followed the feeding flock up the hill and towards the top of Lookout Hill until the rain started to fall. Back down the stairs and towards Prospect Lake, we took shelter under the dense foliage of a stand of maple trees. My only protection against the rain was my cycling helmet and speed, so I waited until the raindrops slowed before heading out of the park. I don't expect to be spending any time outdoors tomorrow, but will keep you posted with post-hurricane observations. Greetings. This is the New York Rare Bird Alert for Friday, August 26th 2011 at 9pm. The highlights of today's tape are BAIRD'S SANDPIPER, HUDSONIAN GODWIT, MARBLED GODWIT, PROTHONOTARY WARBLER, GOLDEN-WINGED WARBLER and DICKCISSEL. Firstly, please note that the shorebird festival, scheduled for Saturday at Jamaica Bay Wildlife Refuge, has been canceled due to continuing high water conditions on the ponds. Despite the refuge's disappointment this year shorebirds remain in the birding forefront though some good landbirds have also occurred this past week. A BAIRD'S SANDPIPER was present today in various puddles along the runways at Floyd Bennett Field in Brooklyn. At Jones Beach West End an HUDSONIAN GODWIT was spotted on the Coast Guard Station bar last Saturday with a MARBLED GODWIT noted across the bay Tuesday. A peak of 5 GULL-BILLED TERNS gathered on the Coast Guard bar on Tuesday and Wednesday and a few BLACK TERNS, a species now quite widespread, have been around the inlet. Two immature LESSER BLACK-BACKED GULLS were at the West End 2 parking lot on Sunday. On Tuesday 3 BLACK TERNS were at the Alley Pond Environmental Center off Northern Boulevard along with 2 SOLITARY SANDPIPERS and 4 COMMON NIGHTHAWKS and another BLACK TERN was at Hempstead Lake State Park on Thursday. A decent landbird flight took place Monday night into Tuesday morning with good numbers noted at Robert Moses State Park on the western tip of Fire Island. More numerous participants included BARN SWALLOW with over 10,000 estimated along with CHIMNEY SWIFT, EASTERN KINGBIRD, CEDAR WAXWING, AMERICAN ROBIN, BALTIMORE ORIOLE, RED-WINGED BLACKBIRD and BOBOLINK. The Moses flight also included a WHIMBREL, 2 CLIFF SWALLOWS and a DICKCISSEL. Tuesday also produced a good variety of warblers among them TENNESSEE WARBLER, BLUE-WINGED WARBLER, NORTHERN PARULA, CHESTNUT-SIDED WARBLER, MAGNOLIA WARBLER, BLACKBURNIAN WARBLER, BLACK-THROATED BLUE WARBLER, BLACK-THROATED GREEN WARBLER and CANADA WARBLER. Also on Tuesday an OLIVE-SIDED FLYCATCHER was found at the Hoyt Farm Preserve in Commack and a GOLDEN-WINGED WARBLER appeared in Northwest Woods in East Hampton in the afternoon. In northern Westchester a female PROTHONOTARY WARBLER was found at the Rockefeller Preserve on Tuesday with a GOLDEN-WINGED WARBLER there on Wednesday. At Heckscher State Park on Wednesday a BAIRD'S SANDPIPER was seen in a puddle in lot 7 before being flushed off and also at Heckscher were two ROYAL TERNS with 6 COMMON NIGHTHAWKS noted around 8pm. A BAIRD'S SANDPIPER was seen again in the same area on Friday. Last Sunday at Cupsogue County Park in West Hampton Dunes, on the flats north of the parking lot, the count of MARBLED GODWITS reached 8 seen simultaneously and they were joined for awhile by 2 WHIMBREL. PECTORAL SANDPIPER was also present and over 50 ROYAL TERNS were on the bars and around the inlet. A seawatch from Cupsogue was not terribly productive with just a few CORY'S SHEARWATERS but over 30 BLACK TERNS were noted moving east along the ocean. MARBLED GODWIT and WHIMBREL were also seen on the flats on Tuesday. Four BLACK and 2 ROYAL TERNS were at Shinnecock Inlet Monday the same day producing 5 BLACK TERNS, 14 BLACK SKIMMERS and a PECTORAL SANDPIPER at Mecox. Two to 3 WHIMBREL continue to be seen at Cedar Point Park in Southold on the North Fork and 4 WHIMBREL were reported from Ditch Plains in Montauk on Monday. If you are going out after hurricane birds this weekend please be careful and let us know what you see. Sticking with a summer theme, today's photo is of a Seaside Grasshopper. 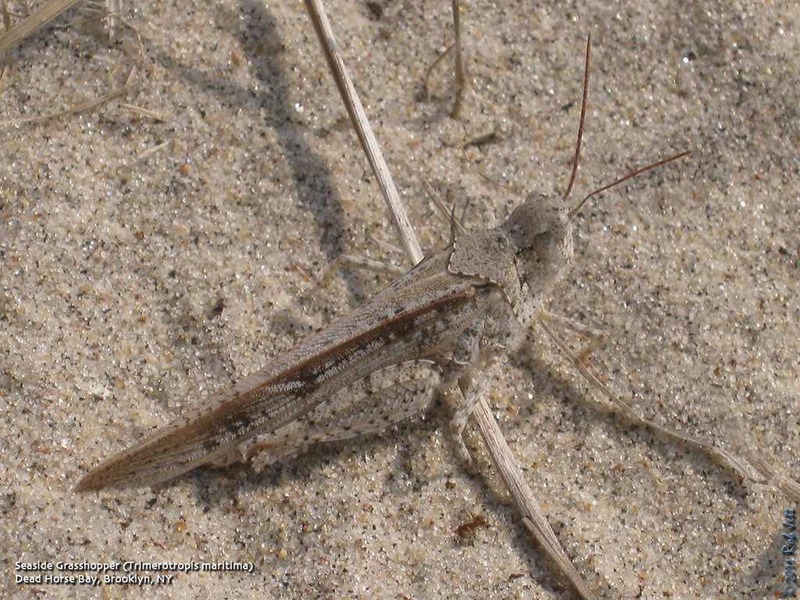 As its name suggests, this species of grasshopper is found in sandy habitats and nearly disappears within its background. 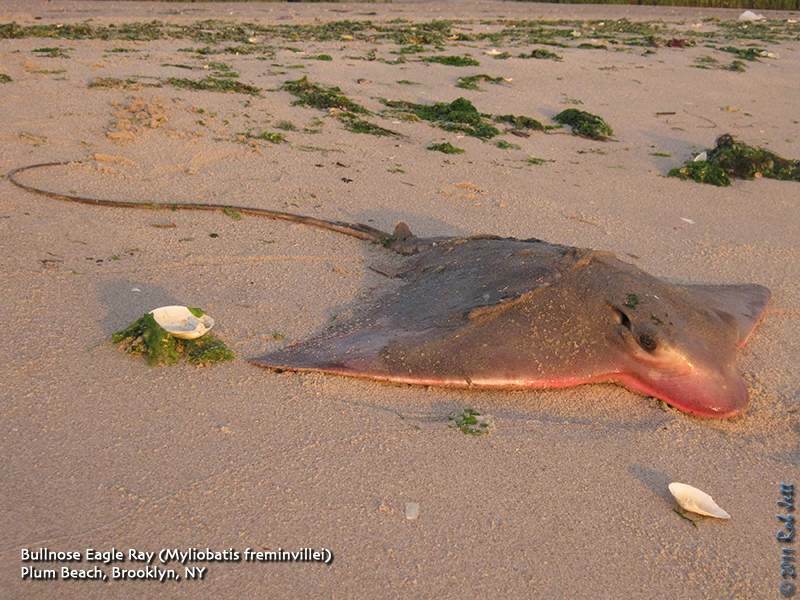 I found this individual at Dead Horse Bay in Brooklyn. Meet at the refuge visitor center at 7am for a hike around the East Pond. Digital slide presentations before & after lunch. Afternoon hike around the West Pond. Leaders: Tom Burke, Kevin Karlson, Don Riepe, Lloyd Spitalnik, et. al. Call (718) 318-9344 to reserve. Instructors: Kevin Karlson, Don Riepe, Lloyd Spitalnik With the American Littoral Society and Gateway National Recreation Area Each fall, many thousands of shorebirds pass through NYC on their way to southern destinations. 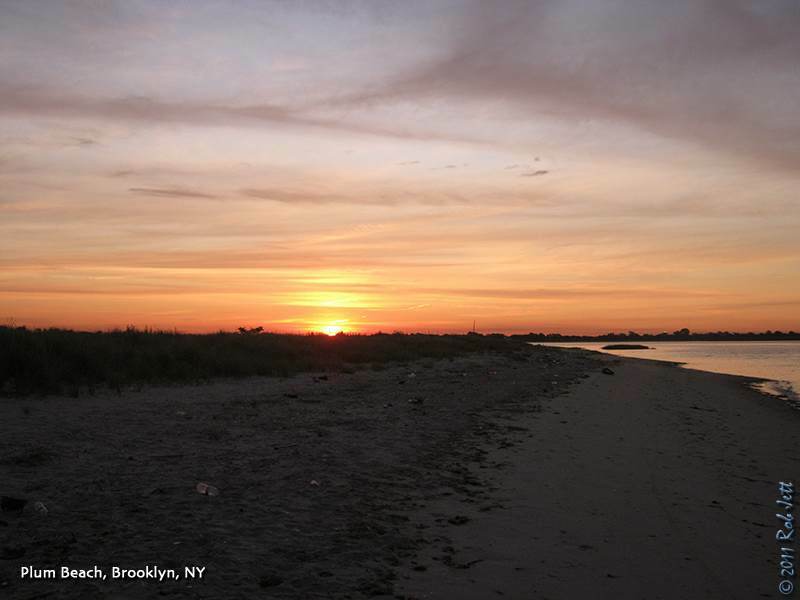 Join NYC Audubon at the 6th Annual Jamaica Bay Shorebird Festival during peak fall migration. 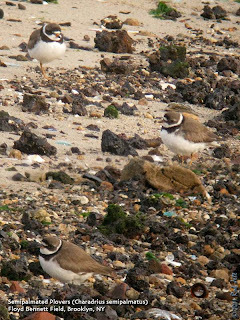 Learn about behavior, biology, and how to identify shorebirds in the field from experts. Bring water, lunch, and binoculars--and wear sensible shoes. The program is free, but donations are requested. Reservations required. For more information or to register, contact Don Riepe at 718-318-9344 or donriepe@gmail.com. Limited to 75. ***MEMBERS-ONLY*** Bus transportation is available from Manhattan to Jamaica Bay. Meet at 71 W. 23rd St. at 6:30am. Free for contributing members at the Student/Senior level and up. Contact Emily Loffredo at 212-691-7483 to reserve a seat. Saturday, August 27, 8:00a.m. to 10:00a.m. Walk the watercourse of Clove Lakes Park and search for the "early bird specials" of fall. A north wind might bring dozens of species of warblers, and various neo-tropical migrants from the Catskills and Adirondacks on their trip south for the winter. Meet atop the Martlings Ave. Bridge. 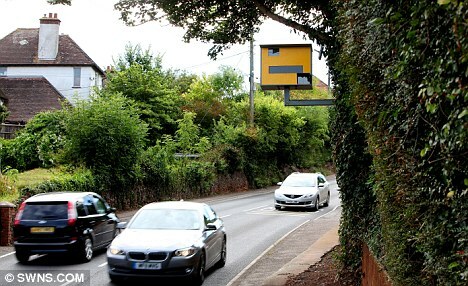 Pensioner ordered to take down fake speed camera from outside his home.... although he claims it's a bird box! A pensioner has put his foot down on speeding motorists by erecting this bird box outside his home - which looks like a speed camera. Ian Magee, 63, was fed up with motorists breaking the 30mph speed limit on the main road in Williton, Somerset, so he decided to make his own deterrent. Mr Magee says the device been effective in slowing traffic - but the local council could order him to remove it for breaching planning regulations. He said: 'Many motorists travel more than double the speed limit down this hill and tourists also cause a problem. The camera even has its own CCTV camera next to it in an attempt to stop vandals damaging it. The father-of-two said the key to making it perfect was finding the right coloured paint to cover the plywood box. Ian, a retired car salesman, said: 'It has been great so far and has convinced so many people. But the bird box has caused a split between the local authorities. But West Somerset Council believes it breaches planning rules and want it removed. A statement released by the council said: 'This is something we are currently looking into as we feel that this kind of object requires planning permission, which it doesn't have. 'We also feel the box should be taken down as it is providing unnecessary clutter to the area. Mr Magee said that the birds have taken very fondly to the box, which they can enter from the left hand side. Last weekend Heydi and I did a little shorebird birding around Brooklyn. Some species of shorebirds actually begin their southbound journey in July, but mid-August is when shorebird migration really begins in earnest. Plum Beach at low-tide is the best spot to look for migrating shorebirds in Brooklyn. When the water is low it exposes a fairly large mudflat where the birds can probe for marine worms and other food. On Saturday the low-tide cycle would be close to noon when lots of human activities would make observing the birds impossible. The next best thing would be if we arrived at first light, when the water was receding and birds were beginning to gather along the shore. As the sun was coming up over Gerritsen Creek to the East we could see small, dark shapes scurrying along the edge of the water. They were mostly Sanderlings, but after a few minutes, we spotted a Black-bellied Plover, several Semipalmated Plover, a small flock of Ruddy Turnstone and many Semipalmated Sandpipers. American Oystercatchers made their usual racket as they traced random flight patterns over the marsh and bay. A single Piping Plover darted back and forth between the edge of the water and the wrack line. Continuing our walk around the edge of the marsh at Plum Beach we spotted a single Black Skimmer working the surface of the glass-like water. One unexpected find was a young Seaside Sparrow calling from his perch atop the marsh grass. He was eventually joined by a curious Marsh Wren. A Solitary Sandpiper snapped up insects from a narrow stretch of exposed sand bordering the marsh. We left Plum Beach by 7:30am and headed over to Floyd Bennett Field. The usual spots to look for shorebirds at Floyd Bennett Field are the puddles at the runway near the North 40, the small field next to Aviator Sports, the cricket field and the beach/pilings at the end of Archery Road. Actually, any of the runways could have fairly sizeable puddles after a summer thunderstorm, so it is a good idea to check them all for shorebirds. We didn't find anything unusual in the western spots, so headed to Archery Road to scan the beach and a stretch of old, wooden pilings. Several Semipalmated Plovers were resting along the shore and nearly disappeared among the dark and light patches of concrete and other detritus littering the beach. There were also a few Spotted Sandpipers tettering along the beach. 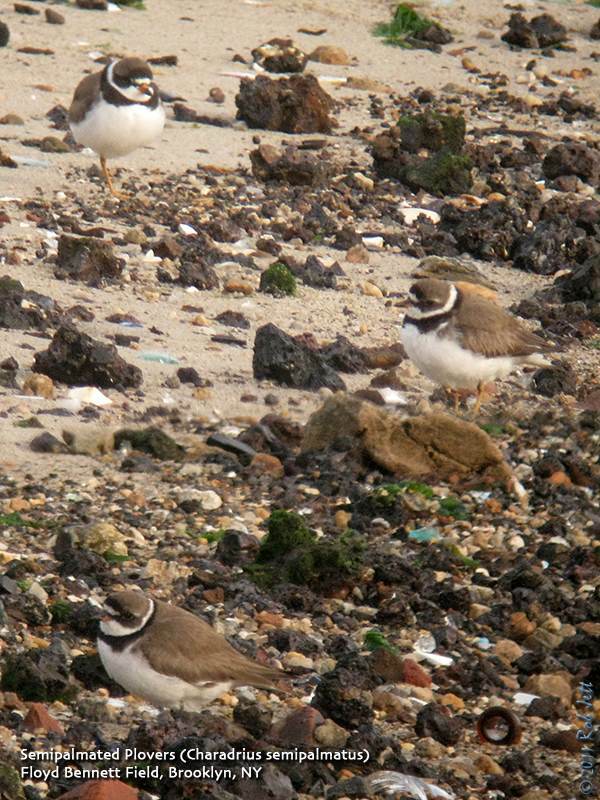 At the far end of the beach, near the Coast Guard Station were a couple of Ruddy Turnstones. Double-crested Cormorants adorned the tops of the wooden pilings. Come winter, their numbers will decline and Great Cormorants will replace them at this favorite roosting spot. By 9:00am we had been out birding for nearly 3 hours. Feeling good about picking up 3 new species for the year, I decided to call it quits for the day. Greetings. This is the New York Rare Bird Alert for Friday, August 19th 2011 at 7pm. The highlights of today's tape are WESTERN KINGBIRD, RED-NECKED PHALAROPE, MARBLED GODWIT, HUDSONIAN GODWIT, WHIMBREL, MANX SHEARWATER, CORY'S SHEARWATER and GREAT SHEARWATER. First a Jamaica Bay update. After recent rains and with no appreciable drainage occurring on the East Pond, the water level on the pond is now almost too high even for ducks. Yes, that is a joke. But unfortunately the absence of shorebird habitat there is no joke. If you are concerned about the lack of appropriate edge for shorebirds please call Gateway National Park personnel to voice your complaints as to how poorly the situation has been handled this Fall. 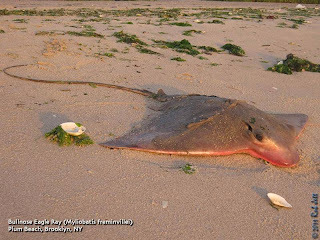 You can call Linda Canzanelli at (718) 354-4665 or send an email to linda_canzanelli [AT] nps.gov or to doug_adamo [AT] nps.gov ... Something drastic needs to be done with the East Pond or as a fallback to the West Pond with the shorebird festival only a week away. Last Saturday before the rains two HUDSONIAN GODWITS were present along the west side of the East Pond and north of The Raunt with a MARBLED GODWIT across the way. At lower tides the godwits were also seen along the edge of the bay north of the East Pond with two Marbleds there. At a large puddle formed at Floyd Bennett Field last Monday a gathering of shorebirds featured a RED-NECKED PHALAROPE and 22 PECTORAL SANDPIPERS. At Jones Beach West End the HUDSONIAN GODWIT was last reported on the Coast Guard bar on Saturday afternoon while two MARBLED GODWITS continued there or on the bar across the inlet up to Wednesday with one noted Thursday. Also at West End Sunday in pools in the dunes were 1 PECTORAL SANDPIPER, 3 WHITE-RUMPED SANDPIPERS and 16 STILT SANDPIPERS. A BAIRD'S SANDPIPER was seen in a puddle in Robert Moses State Park parking field 2 today and birds out at Democrat Point on the western tip of Fire Island today included single MANX SHEARWATER and WILSON'S STORM-PETREL, 3 BLACK TERNS and 2 ROYAL TERNS. Out on eastern Long Island a WESTERN KINGBIRD was found Sunday at the Deep Hollow Dude Ranch east of the town of Montauk and was still present today. The bird has been using the fence lines along the pastures on the south side of Route 27 but later today it was across Route 27 at the Roosevelt Third House County Park. Fifty COMMON EIDER were counted at Montauk Point on Sunday. At Cupsogue County Park in West Hampton Dunes the MARBLED GODWIT total rose to 6 by Wednesday when a WHIMBREL was also present on the flats north of the parking lot. Over 30 ROYAL TERNS and a few BLACK TERNS have also been frequenting these flats. A seawatch off Cupsogue Sunday noted over 80 CORY'S SHEARWATERS with a MANX and GREAT SHEARWATER and several WILSON'S STORM-PETRELS. Some ROYAL and BLACK TERNS were also feeding offshore. More CORY'S SHEARWATERS were also seen off Shinnecock Inlet. Today at Cupsogue the 6 MARBLED GODWITS were still present and shearwaters were still offshore mostly all CORY'S with a GREAT or two. Two immature LESSER BLACK-BACKED GULLS were with other gulls on the Tiana Beach parking lot off Dune Road last Sunday. Shorebirds on the flat at Sagg Pond in Bridgehampton Tuesday included single MARBLED GODWIT and PECTORAL SANDPIPER and 12 BLACK SKIMMERS were at Mecox that day. On the North Fork at least 2 WHIMBREL were still at Cedar Beach Park in Southold on Wednesday and 20 ROYAL TERNS were on Robin's Island off New Suffolk today. Among the southbound migrants recently have been some evening COMMON NIGHTHAWKS these usually peaking in late August and early September. The treetop buzzing of cicadas is part of our annual summer soundscape in Brooklyn. 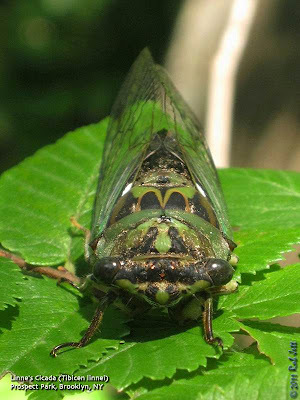 Rarely seen, I found this Linne's Cicada in Brooklyn's Prospect Park. Click here to listen to its song. "Given the startling statistic that Americans consume 80 million single-serving bottles of water per day, it's no surprise to learn the product is plagued by a firestorm of corporate, health-related and sociopolitical issues. 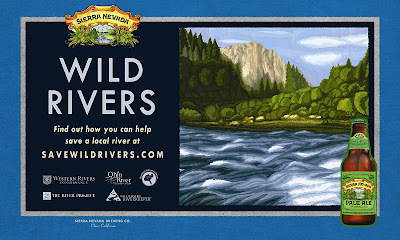 More shocking is that, while municipal water supplies are highly regulated, bottled water (40% of which, the film states, is simply purified tap product) is subject to little or no oversight, helping give such deep-pocketed bottlers as Nestle, Coca-Cola and Pepsi further license to run roughshod over community, medical and environmental concerns. And, "Tapped" contends, there is much to be concerned about, from the toxins that can exist in pre-packaged water to the dangers lurking within the crude oil-derived plastic bottling itself." "Soechtig's cautionary tale is well supported by interviews with a variety of activists, environmentalists, community leaders and, especially, several small-town residents whose health and welfare have been compromised by the encroachment of the bottled water industry. If their stories don't persuade you to ditch the Dasani, vivid shots of how water bottle refuse is turning our oceans into "plastic soup" should do the trick." Location: Meet at the end of Kissam Avenue. Parking is limited. More parking available along Old Mill Road and Guyon Avenue. Description: Come see interesting, remnant maritime plants. These coastal communities are very rare in New York City. We will see dune grasses, asters, goldenrods and Eastern prickly pear, the only cactus native to the eastern U.S. and a NYC rarity. Saturday, August 20, 10:00 a.m. to 2:00 p.m.
Meet at the bike path entrance on the Old Mill Road next to St. Andrews Church (the old one). We will walk along path toward its T-junction where we will cut invasive vines that strangle saplings on the north side of the trail. If you don’t have your own, Protectors will supply gloves and pruners (and refreshments). After a two hour work session (our 182nd consecutive monthly workshop), we will take a short walk over nearby trails. Sunday, August 21, 1:00 p.m. to 3:00 p.m. Celebrate Staten Island's 350th birthday, naturally, in the heart of the Greenbelt. Two of the borough's premier environmental organizations, the Greenbelt Conservancy and Protectors, are joining forces to bring an afternoon of learning to examine nature more closely, with a variety of lenses, as well as the naked eye. All children will receive a magnifying glass courtesy of Protectors. For registration or more information call Jessica Kratz at (718) 351-3450 or Chuck Perry at (718) 667-1393 or email naturecenter [AT] sigreenbelt.org. Greetings. This is the New York Rare Bird Alert for Friday, August 12th at 8:00pm. The highlights of this tape are WHITE IBIS, SANDHILL CRANE, BUFF-BREASTED SANDPIPER, MARBLED GODWITS, HUDSONIAN GODWITS, WILSON'S PHALAROPE, MANX SHEARWATERS, GREAT SHEARWATERS, CORY'S SHEARWATERS, and PARASITIC JAEGER. There has been no sign of the Gray-hooded Gull since last week. Though the water level on the East Pond at Jamaica Bay Wildlife Refuge remains too high to attract a good congregation of shorebirds, the problems with the outflow are being addressed. In the interim, the pond has attracted some longer-legged rarities. On Thursday morning, two immature WHITE IBIS were spotted resting along the west shore of the pond, well above the Raunt and Big John's Pond overlook. And present in the same area were two MARBLED GODWITS and two HUDSONIAN GODWITS. Then early Friday morning a SANDHILL CRANE was reported flying over Cross Bay Boulevard to the west, but it could not be relocated. The two MARBLED GODWITS were seen however along the bay beach north of the East Pond this afternoon. 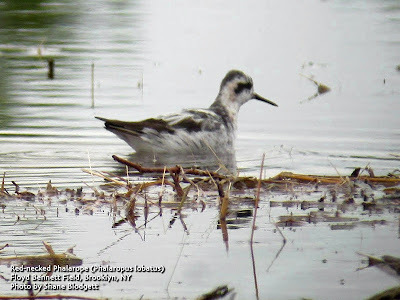 Otherwise, shorebird numbers remain unfortunately low on the East Pond, but a juvenile WILSON'S PHALAROPE did appear Monday at the south end, where a little shoreline does exist. Checking the south end of the West Pond at high tide, where numbers of dowitchers and other shorebirds have been gathering, could prove productive until the East Pond conditions improve. Another WHITE IBIS, age unknown, was spotted flying west past the north end of the Robert Moses Causeway bridge on Wednesday afternoon. And the immature WHITE IBIS continues at the Wallkill National Wildlife Refuge off Oil City Road in Orange County. At Jones Beach West End, shorebirds recently include what was probably the same HUDSONIAN GODWIT in the parking lot at West End 2 on Tuesday and on the Coast Guard Station bar on Thursday. Also there Thursday were 5 STILT SANDPIPERS and 235 AMERICAN OYSTERCATCHERS. This morning the HUDSONIAN was again on the bar, and later out on a bar in the bay with two MARBLED GODWITS. Last Friday a BUFF-BREASTED SANDPIPER appeared at Democrat Point on the western tip of Fire Island, where seabirds offshore that evening featured 1 MANX SHEARWATER, 3 GREAT SHEARWATERS, and 80 CORY'S SHEARWATERS. A LESSER BLACK-BACKED GULL was also there. A similar mix of seabirds was also noted last Friday off Cupsogue County Park in West Hampton Dunes, when 1 MANX, 2 GREAT, and 60 CORY'S SHEARWATERS and 25 WILSON'S STORM-PETRELS were counted. A PARASITIC JAEGER was off Cupsogue on Saturday. Sunday at Cupsogue the lingering MARBLED GODWIT and a PECTORAL SANDPIPER were among the shorebirds on the flats, which also produced a BLACK TERN and 68 ROYAL TERNS between there and Pike's Beach to the east. A trawler off Cupsogue Sunday morning attracted a good number of birds, including 150-200 CORY'S SHEARWATERS, the only shearwater to be identified, though others may have been present. A WILSON'S STORM-PETREL was also spotted. Later Sunday at Shinnecock Inlet 115 CORY'S SHEARWATERS were counted sitting just outside the inlet and floating in with the incoming tide and flying back out again. A pool along Dune Road, west of the inlet Sunday contained 9 STILT SANDPIPERS among a collection of yellowlegs and peeps. And a gathering of gulls in the main Tiana Beach parking lot contained at least 5 immature LESSER BLACK-BACKED GULLS. Last Saturday an afternoon watch off Amagansett produced 2 CORY'S SHEARWATERS, a PARASITIC JAEGER and 3 BLACK TERNS, and at Napeague there were 5 BLACK and 50 ROSEATE TERNS. Off Montauk Point Sunday were 74 COMMON EIDER and a SURF SCOTER. A WILSON'S STORM-PETREL was seen in Long Island Sound off Shoreham last Saturday. 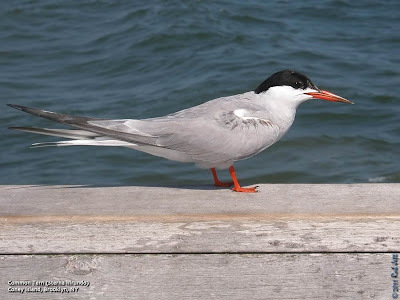 On the North Fork, a few WHIMBREL have been present lately at Cedar Beach in Southold, and on Wednesday two CASPIAN TERNS were on the beach in New Suffolk. A small land bird flight Wednesday and Thursday brought some migrants to coastal Long Island and Westchester, these including LEAST FLYCATCHER, BLUE-GRAY GNATCATCHER, NORTHERN PARULA, BLACK-AND-WHITE WARBLER, CANADA WARBLER, AMERICAN REDSTART, NORTHERN WATERTHRUSH and BOBOLINK. Common Terns are listed as "Threatened" in New York State. This individual seemed quite comfortable on the fishing pier at Coney Island, although I don't think that they nest in this crowded section of Brooklyn coast. Most likely the terns seen feeding around Coney Island are from the breeding colonies across the bay at Breezy Point. 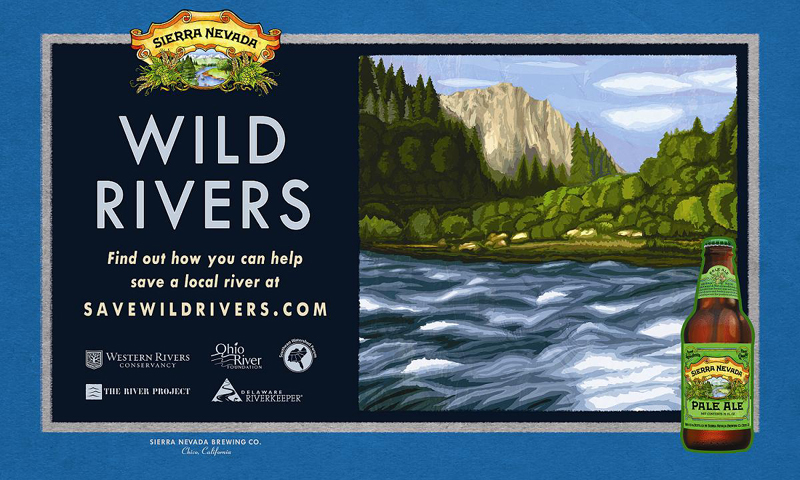 Through the Wild Rivers Partnership Sierra Nevada Brewing Company will donate a portion of the proceeds from all Sierra Nevada 12-packs sold between August 1st and September 10th to the River Project and other Wild Rivers organizations. I've added a new page of wildlife rescue information to the sidebar here. It's a work in progress, so feel free to contact me if you have others that you think should be included in the list. Robin and I went to Jacob Riis Park on Monday. It was the first time in about a month that I noticed lots of migrating shorebirds. The vast majority of the small shorebirds seen heading south appeared to be Sanderlings, but there were also a few Least Sandpipers and Ruddy Turnstones. American Oystercatchers seemed to be a lot more abundant, but that might just be the result of this year's local broods becoming more active. 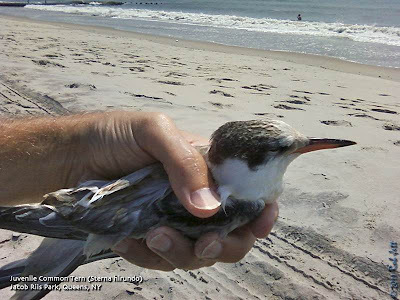 We were walking west along the beach, towards Fort Tilden, when I spotted a young Common Tern standing on the sand. It was next to an adult that I assumed was its parent. The adult flew off as we got closer, but the young bird stayed. A Herring Gull approached the small tern, then grabbed it in its bill. The tern struggled to get loose. 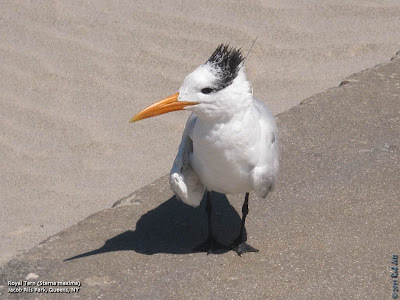 I ran over waving my arms and the gull flew off, leaving the visibly shaken tern behind. The juvenile bird seemed alright, but didn't attempt to fly, even as I bent down to pick it up. 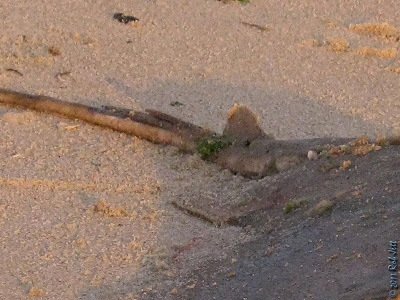 I decided to place it on the wooden pilings at the end of one of the jetties, thinking that it was safer than on the beach. Robin and I then continued walking down the beach. When we returned I noticed that the tern was no longer resting on the jetty so I assumed he had regained his senses and flown off. Then Robin pointed to a spot in the sand at the edge of the receding waves. I'm not sure if he had flown to that spot or fell into the water and was carried to the shore, either way, he didn't look well. I picked him up and called Bobby Horvath. Bobby was working in Rockaway until 5pm, but told me to drop off the tern at the firehouse on Beach 169th Street and he would pick it up on his way home. The firehouse was closed until 1pm, so I had to hold on to the bird for a little while. I walked up to one of the food concessions to get a small cardboard box. By this time the tern seemed to have gotten used to me and had settled down. He didn't appear to have any external injuries and he was able to hold his wings out, so there didn't seem to be any fractures. The girl working the concession seemed completely freaked out by the tern. I tried to reassure her that it wasn't going to hurt her and that it weighed less than a half a roll of pennies. She forced a smile then slid two cardboard beverage holders across the counter. I put the tern in one, poked several 2" holes into the second cardboard piece then placed in over the top.